If you’re looking for the best peanut butter buttercream recipe ever…or really, the perfect frosting to go on literally anything…STOP! Look no further, you found it! I am a lover of all things peanut butter. You KNOW this, right?! 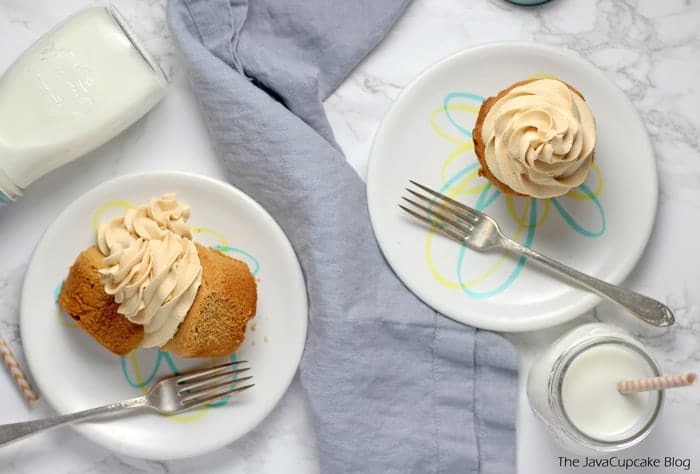 And if you haven’t gathered by the dozens of peanut butter recipes I have on my blog…I’m kinda obsessed with my recipe for peanut butter buttercream. I’ve been in search of the perfect recipe for some time now. I’ve tried lots of recipes from baker friends and recipes from blogs, but finally, with some fine-tuning of several recipes put together, I’ve discovered the most amazing recipe ever. It’s one of my finest creations. It’s what I consider to be…the Perfect Peanut Butter Buttercream! 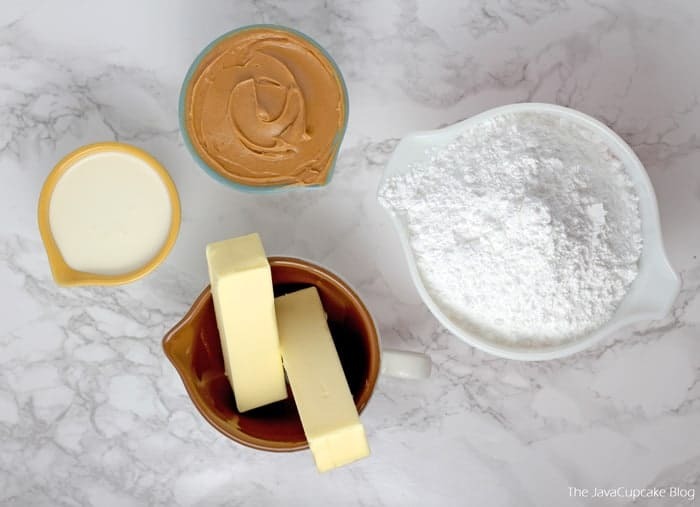 In the bowl of your stand mixer, cream together the peanut butter and butter for 2-3 minutes. You want the color to lighten by a few shades. Add the powdered sugar. Scrape the sides of the bowl and mix until combined. Pour in the heavy cream and beat until smooth. Scrape the bowl again. First off…the texture. The taste. I can’t ask for anything more in a peanut butter buttercream. It’s creamy, light, fluffy, smooth, and spreads extremely well. It’s FULL of peanut butter flavor but isn’t super sweet, so if you’re a fan of good ol’ PB but don’t necessarily want to overdo it…this is your recipe. Or… do like I do and eat it by the spoonful! …and I bet however you use it will also be awesome! So, in short…go make that peanut butter buttercream! How many cupcakes does this recipe frost? Does this buttercream hold up in warm weather? Like all buttercream, this peanut butter buttercream is made with butter, so extreme heat will cause it to melt. Can I use this to frost a cake and will it be enough? To frost a small 2-layer 6-inch cake you will probably have enough. Anything larger, I’d suggest doubling the recipe. 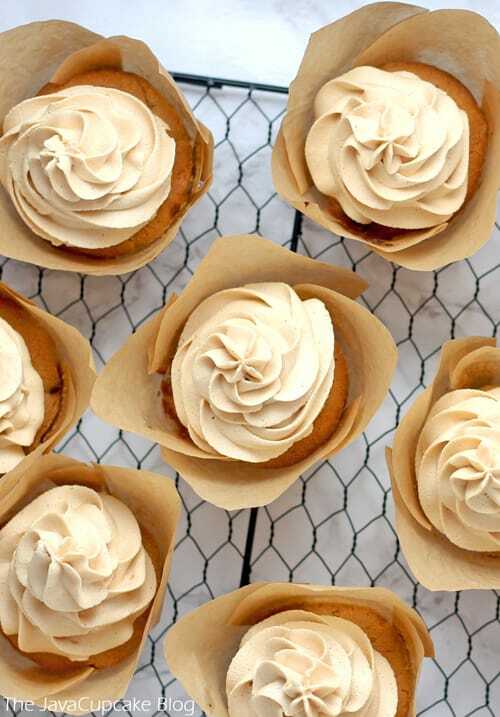 Can I use a piping tip and pastry bag with this peanut butter buttercream? Can I color the frosting for themed food? I’m unsure! I’d recommend doing a test batch first. If I pour ganache over the top, will the buttercream hold up? If you chill the frosted cupcakes for 20 minutes first, they should be okay. I can’t promise anything though! Can I use milk instead of cream? Yes, but beware… the frosting will be less fluffy! And I think the fluff is kind-of the point…but you can always do what you’d like! Can I make this with more or less peanut butter? Sure! Adjust the flavor how you want it. What about any other substitutions? Like I said earlier, I perfected this after toooons of experimenting! Though I always encourage trying something new, it wouldn’t be “perfect” anymore if you used substitutions, and I don’t know how it would turn out. I can’t fully recommend it…but feel free to mess around. Tell me how it goes in the comments! Does it need to be used right away? No, you can refrigerate this for 2-3 days. I really do recommend making it right before you have to, though, so you don’t have to keep bringing it to room temperature every time! How long is it edible if it’s stored in the fridge? I’d say about 10 days. PS… Here’s more of my recipes featuring this buttercream! Check out my PB&J Chocolate Cupcakes! Or…my Peanut Butter Buttercream Tagalong Cookie Sandwiches! Or…these Triple Chocolate Peanut Butter Cupcakes! If you’ve made any of these recipes or used this peanut butter icing on something totally new, I’d love to hear about it below! If you’re looking for the best peanut butter buttercream recipe ever…or really, the perfect frosting to go on literally anything...STOP! Look no further, you found it! Add the powdered sugar, scrape the sides of the bowl and mix until combined. Oh – it’s the BEST recipe I’ve ever had! Seriously. Light, fluffy. So good! Would like to try this recipe with a chocolate ganache poured over it. Will it hold up ok? I’d suggest chilling the frosted cupcakes for a bit first before drizzling over the ganache. This will ensure the frosting doesn’t melt since it’s made of butter and sugar. Hi. I have found that if you use about 1/3 cup of cream of tartar and blend in with dry ingredients before adding the wet ingredients it holds up better for decorating. I just made this frosting and oh my gosh! It’s absolutely wonderful. I followed the recipe exactly and my frosting came out light, fluffy, and full of peanut butter flavor. I added this recipe to my cookbook because I love it so much. Thank you for sharing it! I love peanut butter frosting, but haven’t made my own yet. I’m definitely trying this! I would love you to link up this recipe to this week’s Food Holiday Link Party at my blog. The theme this week is peanuts in honor of National Peanut Month, so this recipe totally fits the bill! http://www.ratetheplateutah.com/2013/03/food-holiday-link-party-national-peanut.html Thanks! Stopping by from Food Holiday Link Party.. This sounds awesome. Pinning it. I didn’t think I could make it the way you do but I was so happy that I followed your directions exactly and it came out marvelous for Evan’s cupcakes for his party. One of the boys asked me if I could share the recipe with his mom and I became a walking Javacupcake advertisement, again! I LOVE this PB buttercream and want to put it on EVERYTHING! Thanks for sharing your wonderful creations. It makes happy tummies in my house! That sounds yum!!! Glad you loved this buttercream as much as I do! You could, if you were willing to whip it for at least 5 minutes with your hand mixer. I made this awhile back and my husband is begging for me to make it again! I’m going to use this as a filling in a chocolate cake 🙂 I just want to double check.. It does not need to be refrigerated? I’m making a mini cooper cake, and I need to have it completed and delivered a day before it will be eaten. Will this be ok? Hi there! I made this buttercream and it was perfect! The only thing I did was convert all of the amounts to grams. It was so creamy and the perfect peanut butter flavour. I have posted my adapted recipe on my blog The Baking Medic and I’ve linked back here. Here is the link to my post. i need to find a good sugar free recipe that i can make with splenda, this sounds great so i will try it with splenda!! DEFINITELY spoon worthy!! Thanks for the awesome recipe… I haven’t tasted it with the birthday cake I just made for a friend (peanut butter cake with chocolate cakeballs in it) BUT, I tasted it on a spoon (divine is correct!) and on one of the plain cakeballs… I will for sure use this again!! Oooooooooooh that sounds wonderful! Take lots of pictures of the cake (inside of it too!) I want to see it!! Just made this recipe to top some peanut butter brownies, it is the best peanut butter frosting that I have ever made. I find that most of the time peanut butter frosting spreads almost like marshmallow fluff would spread, almost to the point where you can mold it with your hands like a soft play dough. Not this recipe, it spreads gorgeous and taste wonderful! I feel the same way about this buttercream, Pete! 🙂 Glad you love it as much as I do! Hello, I am making a chocolate cake tonight and I was wondering if this recipe would work under fondant?? I’m not sure. I don’t use fondant and am not familiar with what kind of frosting can be used under it. Sorry I can’t be of more help with your question! I’ve used it with fondant. It works great. My partner is a bit obsessed with PB & J. I used this frosting to complete my dream of a PB & J cake for his birthday and it was the perfect compliment to the yellow vanilla cake layers I made for it (I used the Golden Vanilla Cake recipe from King Arthur Flour). I put a thick layer of home-made strawberry rhubarb jam between the two yellow cakes and topped it with this amazing frosting. It was just right for what I was trying to accomplish. Sweet! That’s awesome!! Did you take a picture? 🙂 I’d love to see the final cake? Oh yum! Those look super duper delicious! Hi everyone- I noticed a comment saying this spread well, but I just wanted to make sure. I am looking at using this for a birthday cake, and I want to make sure it spreads well and looks great! Any comments or instructions? Oh yes, it spreads like a dream. I’ve had no issues with it. It’s a very flight and fluffy frosting, so a heavy cake may take a thicker layer of frosting between the cakes. Other than that, you shouldn’t have any problems with it! I used this recipe on a birthday cake, and it was a huge hit. I also omitted the cream and added chocolate fudge as a filling between layers, and it was amazing! Best response to a cake I’ve ever had! Everyone said it tasted like Reese’s Pieces, and you were spot on, it does have a great peanut butter taste. Thanks so much! Betsy, made this recipe for an old family recipe chocolate cake for Labor Day. …..turned around and it was gone! I made this and it is the smoothest and best icing I have ever made!!! Thank you!!! Yay! I’m glad you love it as much as I do! This looks and sounds amazing!! I am seriously eager to make this, but don’t have heavy cream :'(. Do you think 2% milk would be okay? You can use milk, but it won’t get as fluffy like it would if you used the heavy whipping cream. 🙂 If you only have milk – use it. But the next time you go to the store, pick up heavy cream!! It makes a big difference…. creamy, smooth, fluffy. SO YUM! OH MY….I made this today to go with a chocolate cake…it is heavenly! Absolutely perfect! Won-der-ful! 🙂 So glad you love it! Can I add less sugar? Will it affect the smoothness of the frosting? Hi Ching – You probably could add less sugar, but I wouldn’t recommend it. 3 cups of powdered sugar really isn’t a lot of sugar compared to other buttercream recipes that typically would call for 2lbs of sugar in a recipe that makes this much. And, if you changed it… then it wouldn’t be perfect anymore! 🙂 Happy Baking! Can I use regular butter and skip the pinch of salt? Regular butter? Are you referring to salted butter? I really wouldn’t suggest it. In fact, I discourage using salted butter in any baking. You really want to be able to control the amount of salt in the buttercream. The pinch is intended to offset the sweetness. You can’t control that if you use salted butter. I just created the best chocolate pound cake recipe, …I made three eight inch layers, and now I am making this as soon as its done printing out! I will let you know how it goes! Sounds delish! Let me know how it all turns out! This is possibly the best peanut butter buttercream I have ever tasted. I paired this with a sublime chocolate pound cake, dense and moist. This is one of the best cakes I haved ever served. I am a baker of 30 years and you are to be commended, WELL DONE!! Lorie – those are some very kind words!! THANK YOU for your praise and feedback! Much love to you! Hi Tina – I would NOT recommend making the buttercream ahead. If anything, make the cake/cupcakes ahead and make the frosting just before you use it. 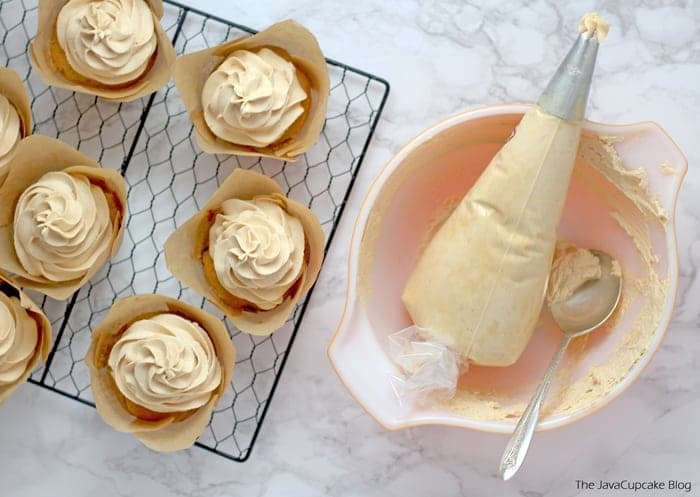 The frosting needs to be light and fluffy and if you put it in the fridge, you’ll just have to bring it to room temperature and whip it again before using. It’s better to make the frosting just before you use it. 🙂 Happy Baking! Yay! It’s my absolutely favorite too!!! Amazing, amazing, amazing. Best frosting I have ever tasted. Seriously. Awesome. Thank you so much for this recipe! O my goodness, this truly is the perfect peanut butter buttercream! Thank you so much for sharing the recipe. I have made dozens of buttercream frostings and they all seem to form a hard shell after 8 hours or so after, this one did not. I put this on top of banana cupcakes with chocolate fudge filling, truly divine. I am in love and can’t wait to try the buttecream in different flavors. That’s wonderful to hear, Lissa! 🙂 Thank you for the great feedback! It makes me so happy to hear that you loved this buttercream as much as I do! Hi i was wanting to know can you this for a outline for a cookie cake. Cece… You can use this frosting to decorate any kind of cake! It’s very versatile! How dark is the brown color for this frosting? Would I be able to tint it blue and red (think 4th of July shades!)? Hi Jocelyn – It’s a light brown… but I’m not sure if it would color without it being a strange tan (all I Can think of is poop brown lol) color. I’d suggest doing a small test batch to try it out. Good luck! I have started doing cakes as a hobby (My husband has been telling me to get one for years.). I will be doing my third wedding this October. The groom wants chocolate cake with PB buttercream. I have been looking for “the perfect PB buttercream” to achieve the spackled look he wants. I was anticipating a lot of searching and trying new recipes. Thanks to you it was a home run the first shot! I’ll be using your recipe on his cake. Thank you! Also thank you for serving our country. It isn’t just the soldiers that sacrifice. The families do too. Blessing in the name of Jesus! Hello! I found this recipe while searching online.. since it uses Heavy Cream, does it need to be refrigerated? Does it travel well? I want to decorate some cupcakes early in the AM and bring with me for a party that night… thoughts? No, it does not need to be refrigerated UNLESS they’ll be served somewhere WARM or HOT or HUMID. Then I’d suggest chilling them in the AM after they’re frosted until about 15-30 minutes before you want to serve them. I haven’t had any problem transporting cupcakes with this buttercream on them. 🙂 Holds up nicely! That’s great news, thanks! Can’t wait to try them this weekend. Made this frosting awhile ago and it was amazing! It was so fluffy and delicious. I was tempted to skip the cupcake-frosting process and just eat this out of the bowl. Thank you so much for the recipe! Hahaha I know, right? This frosting is SO GOOD! Glad you enjoyed it Sophie! I have searched and searched for the perfect recipe and the moment I saw you added heavy cream in this recipe….I knew this was the one for me! (hugs) Thanks for posting!!! Ummm, perfection! People are freaking out over the photo on FB. It is so light and not too sweet! I gave the link to this recipe and let them know about the others! I love using heavy cream! We make our own coffee creamers, cream of chicken, and alfredo…etc It is wonderful stuff! lol (hugs) Thank you again sweet lady! Most of the time, for me, frosting is just a way to make the cupcake pretty. I normally scrape it off and eat only the cake. In THIS case however, I could eat this stuff right out of the bowl and never miss the cake. So light, fluffy, and peanutty buttery yum yum yummy!!! THANK YOU for sharing this recipe!! When I said immediately, I really meant it more like… don’t wait until next week to use it. I’ve used this buttercream a bazillion times and it’s held up for several days after piping or frosting on to cakes. I’ve never had an issue with it running or seeping. 🙂 Let me know how it works out for you! It’s an amazing buttercream! OMG! This stuff is almost orgasmic. There is no other word to describe it! Thank you!!!! You are so very welcome, Heidi! I’m glad you loved it! This looks amazing! (As does your peanut butter m&m frosting). Which one would be better to make (w/chocolate cake) for a person who loves the chocolate peanut butter combo? I’m making it for my friend’s bday, and her favorite candis are reeses and pb m&m’s. I just can’t decide which recipe to use! P.S. I forgot to mention that I’l be downsizing the recipe quite a bit since I’m making her a cupcake in a jar. So does one work better than the other for that? As I recall, the recipes should both be the same. The PB buttercream recipe is the only one I use!! 🙂 Happy Baking, Liz! Awesome, Lance! Milk I’m sure worked wonderfully… the heavy whipping cream just whips up so fluffy making it even more wonderful! So glad this recipe worked for you!! Happy Baking! PS… No worries about the rating! Danke! Hello! This looks yummy!! 😀 Does it crust? Thanks for getting back with me. I’m thinking about using it on a cupcake bouquet and I’m afraid the frosting will fall off if it doesn’t crust, I guess. It is a very soft frosting… so if some of the cupcakes are on their side, I’m pretty sure the frosting will slide off unfortunately. 🙁 Sorry! WOW! I just made this recipe not 20 minutes ago for my fathers birthday cake. He is going to love it!! It is so decadent and the perfect amount of sweet. This is the perfect PB buttercream. Thanks so much for the great recipe! I’m happy to hear that Janet! About how many cupcakes can you frost with this recipe? I have to agree that this is the PERFECT peanut butter buttercream. The texture is perfect, so light and fluffy, and the flavor is amazing. And can I say, the aroma is HEAVENLY!! So hard to resist. Thanks for the awesome recipe! Fabulous Faye! I’m happy you love it as much as I do!! Very good frosting. It is peanut buttery and not overly sweet. I made 3/4 batch for 16 cupcakes and had quite a bit left over. I could have gotten away with just 1/2 batch. Will know for next time. I didn’t use the recommended amount of heavy cream, for my 3/4 batch I only used 3T and it made the frosting a little too soft, so I did end up adding in another 1/4c of powdered sugar to firm in back up a bit. I probably should have stopped at 2T. Just for anyone in the future who prefers a stiffer piping buttercream. Used this to top chocolate cupcakes that I baked a mini Reese Peanut Butter Cup in. Then topped it with your frosting and drizzled with the Reese (Chocolate and Peanut Butter) shell ice cream topping. HI Betsy. Im super excited to use this frosting on some cupcake treats for teacher appreciation week!!! I just wanted to be sure of a few things: Is is firm enough to pipe onto the cupcakes or can you only spread it? In your directions you say to use immediately…. Im making the cupcakes today but can’t take them to school until the morning: will it be ok to make ahead of time? Let me know.. thanks so much for this deliciousness! I sure will!! thank you for the link too> checking it out now! I’m comparing this recipe to others almost identical. The only difference is the huge amount of butter this says to use– is 1 CUP accurate or a typo??? If so, does this have enough of a peanut butter flavor with all of the butter? Totally not a typo. The butter makes is so smooth and light! When you whip it all up it’s a dream! And yes, absolutely enough peanut butter flavor. The difference with my recipe is that you don’t feel like you’re eating a scoop of pb, you’re eating a cloud of peanut buttery goodness! Read the other comments and you’ll see how much everyone loves this recipe! I have found your frosting recipe. Sounds yummy and loving all the awesome reviews. Can I make this frosting tonight and decorate the cake tomorrow for a reception the following day and it will be ok? I don’t want the icing sliding off the cake. Thank you. I rarely comment on a recipe, but I just made this and it is absolutely AMAZING! Soooo delicious. Light, airy, full of peanut butter flavor! A part of me never wants to make regular buttercream again because I think this turned out so much better than my best go-to buttercream! Thank you! So glad I stumbled across this site and tried it out!!! I’m with all the other commenters- it was hard not to just sit with a spoon and a bowl of this stuff- seriously so good. If I hadn’t just made it, I’d say there are drugs in it to make it so tasty! THANK you!! I do a lot of cake decorating. And I just have to say that this is the best recipe both taste and workability I have ever come across! It does not need to go in the fridge but I have put it in the fridge because I was making a cake a couple days before it was going to be served. It does not get hard like regular buttercream. It holds its shape perfectly when piped also. Thank you so much for posting this recipe! It is perfect in every way! So thankful I found this post on Pinterest! I was looking for a peanut butter icing and stumbled across this one. It.is.fabulous! I needed something for my latest creation…alternating layers of chocolate cake and cheesecake baked with peanut butter chips and chocolate chips. This buttercream fit the bill. Very light and delicious. I should have cut the recipe in half though because I have a ton left. Thank you for the awesomeness! 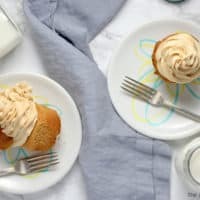 This recipe for peanut butter buttercream is not only heavenly delicious, but it’s amazing to work with! It paired perfectly with my chocolate cake recipe and everyone who has ever tasted it… loved it!! Thanks, Betsy! Going to a friends house for the weekend have to make it the day before including the frosting. I am making it for her b- day and am nervous transporting it as will be at least 4 hours before I get there, will it still be OK,will be using that evening, will I leave it out till eaten and will I refrigerate leftovers? NEED YOUR HELP as I want my cake to arrive in perfect condition.Came across your site by accident and found the perfect frosting I ‘ve been looking for for my friends special day. Not sure if this is where I’m suppose to be asking this question, if not I apologize in advance. Would be very grateful if you could help me out Thanks so much! FIVE STARS,LOVE YOUR SITE,JUST READING YOUR RECIPES CAN TELL YOU ARE SOMEONE THAT HAS A TRUE PASSION FOR THIS IS WHAT I CALL A TRUE PROFESSIONAL.YUUMY!!!!!! After trying a couple other peanut butter frostings, I needed something better. So thankful I found yours! It’s perfect! I halved the recipe and probably used close to a cup of PB, as half a cup just wasn’t a strong enough flavor. The texture is still great! Any idea on how much your “heaping” cup really measures out to? Also, I used store brand PB and found no issues with greasiness. The thing I love about this recipe is that it doesn’t require exact measurements. It can be made with more/less peanut butter to determine the flavor you’re looking for! Heaping to me just means the peanut butter in the measuring cup isn’t leveled off flat, that it’s free to heap up higher than the sides. Not sure exactly what it comes out to because I never make it exactly the same every time! 🙂 Which is why I love this recipe! Glad you love it too! I made a 3 layer devil’s food with this icing. It was easy to make and tastes amazing. I will definitely be using this recipe again!! Sweet but not too sweet and very light and fluffy. Do you use the paddle attachment or whisk attachment for a kitchen aid mixer for this frosting? Thank you! I made this tonight for a cake I decorated and it was perfect! Thank you so much! I loved how it wasn’t too sweet. Also, I think it helped that I used Jif natural, since that PB tends to be slightly less sweet. I did a swirl design with my cake and a piped star border around the bottom, and it was so amazingly smooth–great for piping or spreading! This recipe is perfect! My son requested a chocolate cake with peanut butter frosting for his birthday, but my previous frosting recipe was too dense and sweet. I was surprised that the cream didn’t make this frosting loose, but it came together beautifully, and was light, fluffy and delightfully peanutty. A winner! OMG!!! This peanut butter buttercream frosting is the bomb 🙂 Absolutely heavenly. I just made it yesterday. Thank you so much for sharing this wonderful frosting recipe, Betsy! I just found your site a couple of days ago and will be a constant visitor and have already bookmarked your site. Again, many thanks!!! LOVE, LOVE, LOVE this recipe!!! The peanut butter buttercream is delightful!!! The frosting is easy to spread on cake and tastes divine! Will this recipe cover 36 cupcakes? How many cupcakes? And can I use it with a bag and decorating tips? I’m making chocolate cupcakes for a valentines party and this peanut butter buttercream looks amazing! One dozen cupcakes! 🙂 And yes… as you can see in the photos in the post, tips were used to pipe all the frosting. Happy baking! Looking to make chocolate peanut butter frosting do u suggest adding melted chocolate or cocao powder? And how much does this recipe make, I am making a 5 layered two tier cake. I have used this recipe twice on chocolate cake with rave reviews. I just came looking for it again because I want to make a banana cake and think this frosting will be awesome on it. I will probably drizzle it with chocolate, peanut butter, banana, and chocolate, yum. Fantastic!! Thank you for your feedback, Jennifer! Hi there! How much Buttercream does this recipe make? I was hoping to use it to fill a 2 layer 6-inch cake. Thanks! There should definitely be enough to fill your cake layers. Looking so forward to trying this recipe with chocolate cupcakes! Are you able to tell me about how many cupcakes one recipe of the frosting will frost? Thanks!! I’ve made this four times now and it’s perfect every time! What I love is the measurements don’t have to be perfect. I made yellow mini cupcakes and piped strawberry jam into the center then topped with the PB buttercream. These were a hit and tasted just like peanut butter and jelly sandwiches (only better). I also did chocolate cupcakes with peanut butter filling (PB, conf sugar and butter) and then topped with the buttercream. Big were huge hits with family, friends ands coworkers. I recommend frosting cold cupcakes, then refrigerate the cupcakes in a covered container. Letting them sit for at least a few hours, but preferably overnight, brings out a lot more flavor and helps moisten up and even out the cupcake. I usually remove from the fridge about 15 minutes before serving to halo soften back up the icing. Thank you for sharing this absolutely amazing and addictive recipe. I can’t wait to keep experimenting! So yummy!! Definitely a keeper. I have a lot left over. Can this frosting be kept in the freezer for later use? What can I use instead of heavy cream if I have none.